I'M BACK! Since it's been over a year, lots of changes have happened with my tanks. Fish have come and gone. I'll try to remember to say what happened to all of my projects, but if I don't mention one feel free to remind me! The biggest change that happened is I moved to Georgia for graduate school. This means I had to leave my pond back in Virginia. It is in good hands, tho. My mother still resides in the house and has been taking care of it and keeping me updated. I periodically return especially around the holidays, so photo updates will still come in for the pond. Even before I moved to Georgia, all of my betta fish died, and I did not replace them with more. Betta are beautiful, but they are so fragile. Fall of 2013 the two betta in my divided tank died after contracting what I believe was lymphocystis from the pet store. 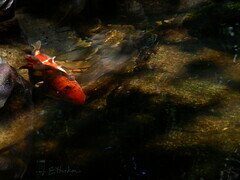 They were both plakats and very beautiful, but I think if I return to betta fish it will be the wild Betta spp. I do plan to keep up my betta care sheet and quick reference page as betta are very popular fish in the hobby. While my betta did not make the trip with me to Georgia, my goldfish did. However, due to the stresses of grad school, I was unable to give them the care they needed. One succumbed to bad water quality before I realized what had happened. I gave away the other. Unfortunately Mr. Waddles, my rescue, died before I moved, most likely due to issues with his tank before he arrived at my house. I don't see myself returning to goldfish keeping any time soon, but I will continue to update my goldfish care sheet because they are such an misunderstood fish. The more misinformation I can correct, the better. Last but not least (I do still have ONE tank) is the 29 gallon community. I still have my adorable loaches. They happily made the trip with me to Georgia. A few cardinal tetra did, too. An accident with dechlorinator was their end. Let this be a lesson to everyone: always add dechlor before you add water back into the tank. However, you may notice there are still little tetra swimming around in the 29 gallon. Recently I got a different species of tetra to fill the upper spaces of the tank. I opted for glowlight tetra (Hemigrammus erythrozonus) due to their hardy nature. They are commonly recommended for beginners due to their forgiving nature, and I've always thought they were pretty. So I wanted to try them out. I received 10 of them and have already been smitten by them. They are surprisingly easier to photograph than my cardinals were. It probably also helps that I got a new camera, too. So those are all the changes that have occurred since my unplanned hiatus. I do not expect to be setting up any more tanks until I finish grad school, have a career, and a house. So future updates will be few and far between.